The Autonomous Rotorcraft Sniper System can hover above the urban battlefield - and it's not just a passive observer. A .338-caliber rifle mounted to the bottom can be fully controlled by the operator, along with the aircraft itself, a Vigilante unmanned helicopter. 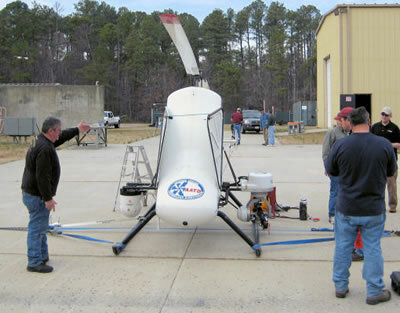 The operator uses a modified Xbox 360 game controller to control the Autonomous Rotorcraft Sniper System. Larry Niven writes about a device that is functionally very similar to this device in his 1972 story Cloak of Anarchy. Update 21-May-2009: Roger Zelazny created the idea of a hovering surveillance drone armed with gun in his excellent Hugo and Nebula award-nominated 1966 story This Moment of the Storm. Thanks to Winchell Chung for pointing out this great reference.